This year, the most popular 12-over-5 pick seems to be VCU over Wichita State. This might be partially because people don’t know how good Wichita State is, since they haven’t seen the Shockers play. But most likely, it’s because of VCU’s run to the Final Four as an 11-seed last year. My guess is that a lot of people figured if the Rams could make it deep into the tournament a season ago, there’s no reason that they can’t win a couple of games this year. Meanwhile, it seems like a similar strategy is being used in picking defending national champion UConn over Iowa State, since that game is the most popular 9-over-8 pick. Well, I hate to be the bearer of bad news, but I think both of these teams are going to lose Thursday night. That’s because Wichita State might be the best mid-major in college basketball, and the Iowa State Transfers are much better than the casual fan wants to admit. If you know anything about me, you know that my claim to fame is nicknaming the Wisconsin basketball team the “Buzzcuts,” because pretty much every white guy who has played for Bo Ryan at Wisconsin has had a buzz cut. When I first noticed this, I thought it was just a coincidence or that maybe the players on that particular Wisconsin team had all buzzed their hair as a sign of unity, kind of like how all of the Pacers shaved their heads for the 1998 playoffs. 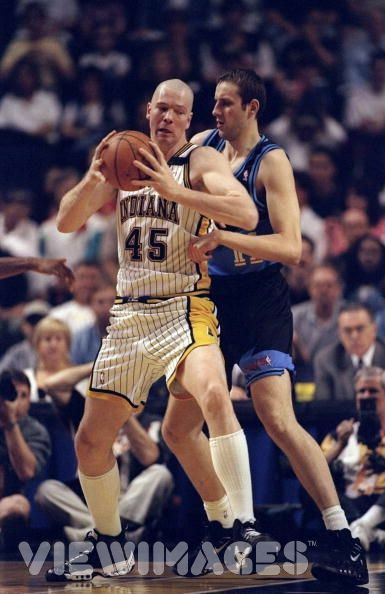 (In case you’re wondering, that link takes you to a picture of a bald Rik Smits posting up a young Zydrunas Ilgauskas.) But every year since then, the pattern has continued. This leads me to believe that Bo Ryan goes over the Ron Swanson Pyramid of Greatness with his team at the start of every season. Anyway, every game the Buzzcuts play in obviously features a ton of buzz cuts, but by my count, tonight Montana could have as many as six white guys with buzz cuts on their team, too. Mathias Ward, who has a history of getting buzz cuts but also likes to grow his hair out a little bit, will be a big wild card for Montana. But even if he didn’t get his hair buzzed for the Big Dance, the Grizzlies should still have enough guys to shatter the record for the most buzz cuts in an NCAA tournament game that is broadcast in color. The last time Gonzaga was a 7-seed in the NCAA tournament, the Bulldogs were forced to travel all the way across the country to play their opening game against 10-seed Davidson in Raleigh, which is just a three-hour drive from the Wildcats’ campus. As you might remember, Davidson won that game on the back of Stephen Curry and his 40 points, and it was the first step in the Wildcats’ run to the Elite Eight. Whether the fact that Gonzaga had to travel 2,500 more miles than Davidson explains why the Zags lost is debatable, but either way, it was clear that Davidson probably got the best draw for a 10-seed in NCAA tournament history. Well, until now, that is, because West Virginia has taken that title. And in a cruel twist of fate, Gonzaga is again the victim of a 10-seed’s fortune. I’m all for the selection committee trying to let as many teams as possible play close to their campuses to make it easier on the fans, but letting West Virginia play Gonzaga in Pittsburgh is a bit much. The Mountaineers are a 10-seed, and yet the only two teams playing first-round games closer to their campuses are 1-seed North Carolina and 2-seed Duke. That’s bad enough, in and of itself. But when you factor in Gonzaga’s 2,000-mile flight to the game this year, and the fact that the Zags had a similar thing happen to them just four years ago, well, it’s just plain wrong. When the news broke that Fab Melo would be ineligible for the entire NCAA tournament, most of us edited our brackets to make Syracuse lose anywhere from one to four rounds earlier than we initially had them losing, and rightfully so. Syracuse’s biggest strength all season has been their phenomenal 2-3 zone, but Melo is the most valuable part of the zone and without him on the court the Orange defense has been noticeably weaker. Meanwhile, the biggest question mark for ‘Cuse all year has been rebounding, so now that its leading rebounder is out it stands to reason that this would be even more of a concern. 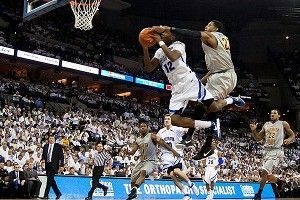 Because of this, all eyes will be on Syracuse this afternoon. But the truth is, this game won’t really tell us much. If Syracuse cruises to a 40-point win, we’ll doubt our decision to have the Orange fall early in our brackets, even though all they did was destroy one of the worst teams in the tournament. And if the Orange win by just 10 or 15, we’ll all talk about how big of a loss Melo is and how ‘Cuse isn’t anywhere close to as good without him, even though the small margin of victory should likely be attributed to Syracuse going through the motions like 1-seeds tend to do in their opening games.